If you’re like me, you’re passionate about shopping for all things crochet! Although I’ve never seen a bumper sticker, “I brake for yarn stores!” I think I could easily apply that one to my car. I love shopping at fiber arts shops and just absorbing the whole creative atmosphere. I especially love the privately owned storefront shops. Their owners are always quite passionate about the topics I am and are especially helpful with any questions I might have. It’s like finding a long lost friend! Walking in a creative oasis provides a sensory overload of patterns and skeins of glorious yarn! I have a favorite store in Petaluma, CA called The Knittery that I always look forward to visiting during my winter vacation. Housed in a turn of the century building and tastefully decorated it is an inspiration and a breath of fresh air! 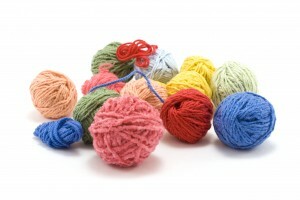 Do you have a favorite yarn shopping destination? Now that you’ve decided on your yarn you need to find the perfect match in a hook. Your crochet hook is like a magic wand turning a skein of yarn into a crocheted masterpiece. It can become your best friend and once addicted it will be a tool you simply can’t live without. When I was a little girl I was obsessed with my grandma’s crochet hooks. There were so many different sizes, colors and in a few cases, different shapes. My favorite was a large size N aluminum hook in Gold. I thought it looked more like jewelry than a tool for making afghans and also made for an awesome (and blunt) sword. She quit crocheting when I was in my late teens due to arthritis and gave me all of her hooks and supplies. I spent lots of days getting them out, looking them over and playing around with them, but never learned to use them. Later, while on bedrest with my second daughter, I finally learned. At first everything I made was completely incorrectly sized, mainly due to the fact that I insisted on using the shiny gold hook for every pattern I was trying to make¸ regardless of what size hook the pattern called for. Soon I learned the difference between the hooks I found in the large tin box, and which ones I preferred over the rest.